Living on the Land – at Last! I usually reckon that if you want to make a living growing vegetables for a box scheme you need five acres (2ha) and a tractor. That’s what Ruth Hancock and her partner Jason ‘Mole’ Cole have got in east Devon at their smallholding, Fresh and Green. In fact Ruth confesses to a certain love for her tractor and a weakness for buying second hand machinery to pull behind it. She hardly ploughs, though. Her main implement is a disc harrow, which cultivates the top layer of the soil but leaves the soil profile undisturbed – a good compromise between the no-till ideal and the practicalities of growing a crop. 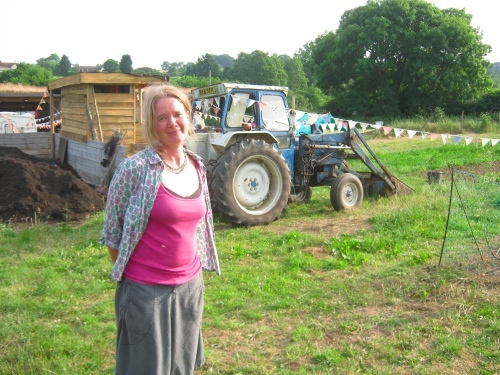 Ruth, with tractor and compost heap. I also maintain – and I’m far from being the only one who says this – that the real key to success on an organic market garden is to live on site. There are such a diversity of jobs to be done, often from first thing in the morning till well after dark, that living off site and commuting to work is a crazy proposition. But that’s what Ruth has been doing for the seven years since they got the land. (Mole mainly works off site as a contract gardener.) But now at last they’ve got temporary planning permission to live on their land and by the time you read this the mobile home will be on site. Box scheme customers want a lot of variety in their weekly box so a much greater range of crops need to be grown than would be the case on another kind of market garden. This makes for a large number of small crops, so constant attention is needed. The customers also want supply throughout the year, so successional cropping is necessary, which adds to the complexity. Just some of the diversity of crops on the farm. One of the greatest challenges for organic growers is slugs, and picking them off the crops by hand is an essential component of a control programme without the use of chemicals. Slugs mainly come out after dark, which makes for a ridiculously long working day if you can’t take a break for an hour or so and start again when the sun has set. This is easy enough if your home is right there on the farm but hard if you live miles away. Chickens and ducks, when integrated into the crop rotation, can seriously decrease the slug population. They also add another welcome product to the boxes, while they clear up the remains of a previous crop and weed the ground ready for the next one. This is the ‘chicken tractor’ idea which is such a favourite of permaculture. 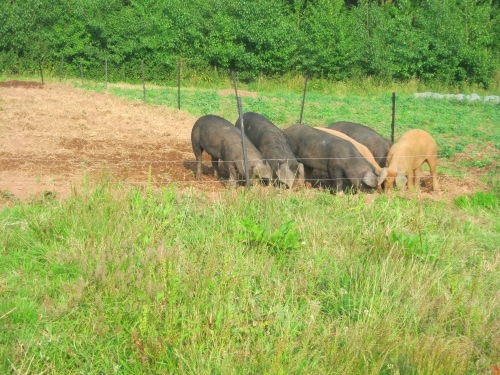 Ruth has both chickens and ducks and also pigs, which can take on heavier cultivation jobs. All these need looking after, feeding and in the case of the poultry shutting up at night, letting out in the morning and egg collecting. This is another important reason for living on site. The pigs: before and after. 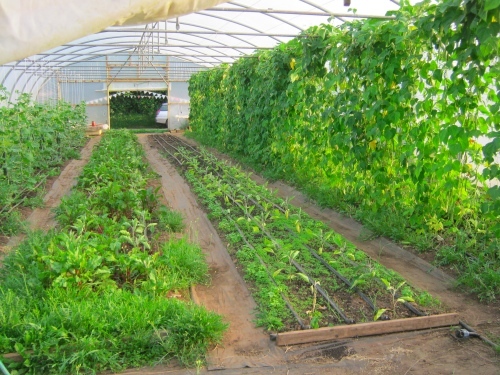 Polytunnels are an essential component of a box scheme. People expect tomatoes, cucumbers and other tender crops in summer and salads in the winter. None of these can be reliably grown outside in the British climate. Controlling the humidity and temperature in a tunnel is the organic way of preventing fungus diseases, and the only realistic way of doing this on a small scale is to be on hand to open and close ventilation as necessary, at any time through the day or night. All in all they had an undeniable need to live on the land, but such is the nature of the planning system that it took them seven years to get permission. Inside one of the polytunnels. I have a personal connection with Ruth and Mole and their land. Mole came on one of our permaculture design courses and when they first got the land they asked me down to give some advice on designing it. So I was very happy to be with them on the land last week when they celebrated getting their planning permission. 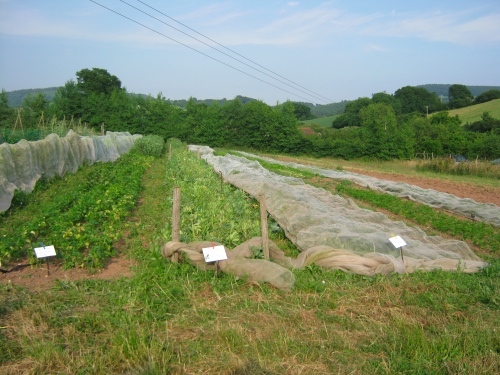 One of the things I had recommended was a network of windbreaks and I was pleased to see them growing well. Good shelter makes a big difference to plant growth on most sites but it’s often sadly neglected. Next to telling people they need to live as close to their vegetables as possible, it’s often the most valuable thing I can recommend to people designing a new growing site. 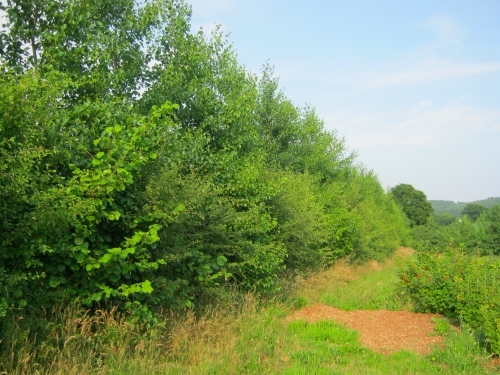 One of the windbreaks, with Italian alder for height and a mix of native shrubs for a thick bottom.